Cast: Nicolas Cage, Eva Mendes, Henry Fonda, Wes Bentley, Donal Logue, Sam Elliott. Story: Motorbike stuntman goes all hot-headed at night. I almost don't want to review this one. Whatever I say, most of you will disagree. Still, better give it a shot I suppose. First of all, Ghost Rider isn't trying to take itself too seriously - though it does a good job of pretending to at times. Nicolas Cage has all kind of deadpan fun as the lead character - which he actually has tattooed on himself in real life and ironically had to hide for filming - but I blame him for the laughable line, "I'm gonna own this curse," at the end - it's got his cheese stamp all over it. Eva Mendes (Hitch) continues to take these empty roles that are way beneath her - she's better than poxy lines such as, "you think I'm pretty, right?" but she does add some charisma. Veteran pebble-voiced cowboy Sam Elliott steals a few scenes as the obligatory crumbly mucker who oh-so-conveniently knows the whole story and Henry Fonda is a curiously weak Mephistopheles. The story holds no surprises whatsoever - stunt rider turns superhero, ticking off all the usual cliches, but the special effects are well worth watching, including a few glorious set-pieces that will remain stuck in the memory of any superhero fan. The budget could've used a few more quid as the timing in the stunts is way off from time to time and Wes Bentley seems to have wandered in off the set of The Covenant - his story thread doesn't seem to make much sense at all and does nothing but detract from the fun of dicking around on a flaming bike - which itself starts far too late in the story - just as well it's a great bundle of good-natured supernatural malarkey when it does begin. 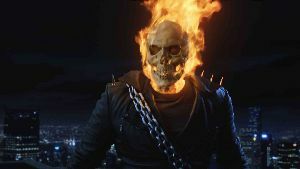 Ghost Rider is way too daft to appeal to everyone, but just daft enough to please people like me. Global opinion is spread across the whole spectrum, with some hating it and some loving it, and most somewhere in between. For what it's worth, I think it's great popcorn fodder, with plenty of memorable moments - just don't say you weren't warned when you disagree. To enjoy this film you should be: into silly supernatural stories. Ghost Rider was released in the UK on 2nd March 2007.